The 2016 Hartford Court Chardonnay Four Hearts Vineyard opens with lemon tart, pink grapefruit, pineapple and ripe apple notes with touches of nutmeg and croissant. Medium to full-bodied, rich and with a pleasantly oily texture, it delivers ripe tropical fruit flavors and a long, creamy finish. 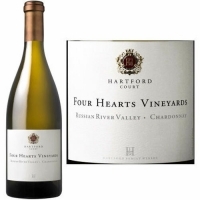 This highly textured wine displays aromas of yellow apple, honeysuckle and tangerine skin. Fresh flavors of Granny Smith apple and Meyer lemon are intertwined with layers of spice and crystallized ginger. A rich and weighty mid-palate is followed by a long, exotic, mineral-infused finish.